Steeped in ancient folklore and superstition, Bram Stoker’s Dracula began life in 1897 as a fiendishly clever Gothic novel. Layers of stage and screen adaptations, chiefly the 1931 Bela Lugosi film, have transformed the Transylvanian vampire into an industry, a genre, and a tradition, chiefly funneled toward Halloween celebrations. Here in Charlotte, there have been highs and lows to our Dracula tradition. The unquestionable low was Charlotte Rep’s adaptation at McGlohon Theatre in 1989, an “authentic” adaptation so universally despised that one of the production’s participants, Duke Ernsberger, wrote a comedy, Dracula Bites, deriding it. Far more successful in meeting common expectations were the dance versions presented by NC Dance Theatre (now Charlotte Ballet) and Moving Poets Theatre of Dance. The Moving Poets version, unforgettably staged in the ruins of Carolina Theatre in 1997, was a landmark, arguably the chief reason why creepshows now rule our theatre scene each year with the onset of October. Steven Dietz’s adaptation, now running at Theatre Charlotte, doesn’t add a new chapter to the tradition, for it first opened here on Halloween night in 2003 at CPCC. But it’s certainly a high point, ranking right up there among the best with the Moving Poets’ saturnalia. Directed by Dave Blamy, this new version at the Queens Road barn sports the set and lighting designs of Chris Timmons, making for some spectacularly unexpected entrances and exits by the Prince of Darkness and his maniacal slave, Renfield. Lena Olson’s costumes are similarly commendable. I haven’t seen Tony Wright look this dashing onstage since he took on the wicked title role in Zastrozzi, the Master of Discipline three years ago. There’s a vivid contrast now between the aged Count that Jonathan Harker encounters in Transylvania and the rejuvenated vampire we see after he has feasted on quarts and gallons of English blood. Wright and his chief adversary, Tom Scott as Professor Van Helsing, were both prominent in the CP production 12 years ago, but the tech and intensity surrounding them weren’t nearly the same. Dietz is neither an authenticist nor a rapt purveyor of the film’s numerous re-shapings. He scrambles the narrative in such a way that we’re frequently flashing back and forth from Mina’s bedroom in England to the castle where her husband, Jonathan Harker, suffers in the thrall of Dracula and his vamping vampiresses. Harker is no longer our epistolary narrator, replaced by Renfield, who appears before us as an urbane gourmand before suddenly transforming into a raving lunatic. Juxtapositions are managed so deftly that, when the curtain falls at intermission, action and energy are peaking simultaneously at three locations, the imperiled Mina’s bedroom, the dungeon where Jonathan is imprisoned, and the asylum where Renfield is in chains. It’s like George S. Kaufman comedy mayhem flipped over into horror, and under Blamy’s direction, the scene comes off as Dietz must have intended. If not better. Dan Brunson’s manic energy as Renfield and his repulsive devotion toward Dracula are like nothing I’ve seen before. Coupled with Brunson’s outré ravings, Scott’s raging fire as Van Helsing now plays like grimly righteous determination. The swashbuckling Wright as the lusting Dracula becomes slightly sympathetic in this company, more fearsome when he’s elderly at his castle or when his strength increases so terribly that the usual charms are powerless against him. “Toys!” he exclaims scornfully, brushing aside the garlic necklace and the crucifix waved in his face. Never the most dashing of heroes, Harker recedes pretty far into the background here, but Jay Masanotti keeps him wholesome and fairly manly in an auspicious Theatre Charlotte debut. Upstaging him are the two women making their Queens Road debuts, Caryn Crye as Mina and Leah Wiseman as her wanton, coquettish best friend, Lucy. Wiseman reminds us just how juicy the role of Lucy is, luxuriating in Dracula’s signature embrace, and hissing at her pursuers when Van Helsing & Co. come to liberate her from the ranks of the undead. It’s deliciously ambiguous whether she loves or loathes her vampire rambles, feeding on the jugulars of innocent children. Dietz dwells no less lovingly on the exploits of Mina, veering audaciously from previous retellings by turning her into an action hero. Journeying from her initial moorings in Victorian propriety, Crye takes us convincingly to a new borderland between ladylike serenity and full vampire rapacity, trapping Dracula with a stratagem that’s too tasty to divulge. 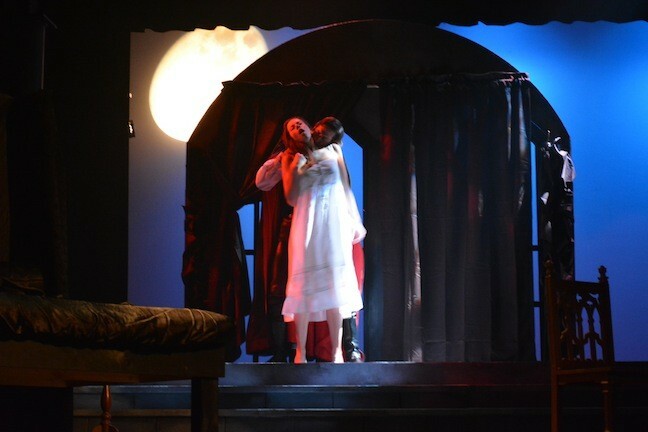 I’ll be damned if Dietz, Blamy, and Theatre Charlotte haven’t given us a truly feminist version of Dracula. Bwaaa-ha-ha!